Welcome to a new series. "Homesteading Where You Are". Greetings! If you're new here, meet the four of us. Justin, Jackie, Adrian, Audra and dog Kammie. Jackie is the blogger. The word "homesteading" was a somewhat unfamiliar word to me some time ago. I always thought of it as a "Little House on the Prairie" type of term. You know, something back in the olden days, building a house and property out of nothing, because that's what they had to do. Someone said something to me about my 'homesteading' journey. I thought, "Oh no, I'm not a homesteader. We have electricity and I use the computer. We have running water and I drive a car." But then, a second person called me a homesteader. I looked up the definition of 'homesteading' on the great researching source-Wikipedia. 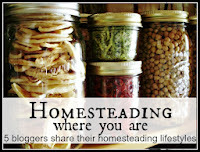 "Broadly defined, homesteading is a lifestyle of self-sufficiency. It is characterized by subsistence agriculture, home preservation of foodstuffs, and it may or may not also involve the small scale production of textiles, clothing, and craftwork for household use or sale." Goodness, that is me. I never had the goal of being termed a homesteader, I was just trying to about my business living the homemade-home grown-from-scratch life. Why? Because I only get one shot at this life and I want to do the best I can. Because I enjoy it. Because I think that's what's best for my family. Because it keeps us home and fosters together time. Because I like learning new things. Because I am cheap. Because seeing the smile on their faces and a genuine 'thank you' makes my heart sing. Because I want to give everything I can to those I love. I guess I am a homesteader. Without realizing it. And I bet you are too...given you're reading this. Getting back to our roots, simplifying, getting dirty, learning new things, exploring, unplugging, and/or living life outside. You're likely doing some of that too. Whether you live with your parents, in an apartment, in the city, suburbs or country, you are a homesteader. Whether you are thinking about learning to cook your own dinners, grow a garden or raise cattle, you are a hoemsteader. And the great thing about being a homesteader is it's a club. A non exclusive club. A whole variety of people who have walked the walk and are talking the talk. And you're invited to join, because this homesteading adventure is too good to go at alone. There's a few of us who will be talking about our homesteading journey every Wednesday for 7 weeks, links at the bottom. Inspiring women, all of them! I grew up on a 50 acre hobby farm. My parents worked to grow/raise and preserve quite a bit. We had a large garden and my mom did a lot of freezing. My dad raised beef cows, sheep, pigs and chickens for food. He also hunted and had bees. I was an avid 4-Her, diving into all sorts of 'back to basics' projects (sewing/quilting being my biggest love) and I had a few rabbits that I tended. After I graduated graduate school, I was living in an apartment. I made it my goal to always have a project I was working on learning something new. Sewing, crafting, cooking, baking, etc. I was forever setting goals and working towards completing them. Might take a few days, month or a year, but I was always trying to learn how to do things myself. I've kept that going...always having something new to learn. We moved to a fantastic little cape in Maine. I spent a lot of time in the kitchen and my crafting studio, but I was unable to grow anything but shade loving perennials. While we loved our last place, it didn't have enough acreage to support much livestock, nor did it have enough light to support vegetable gardening. My generous neighbors let me garden at their farm. I wrote about that here. One year ago, we signed papers and this is the marvelous place became our forever home. We're in a coastal town in Southern Maine. Just a few miles from the beaches, but far enough away to enjoy the peace of country living at its finest. I recently gave quite the tour of our place and the progress we have made. Plus our entourage of animals. Find that post here. Now we have the opportunity to have our own, large garden. I'll talk about that garden in weeks to come. I try to make, grow, raise as much as possible of what we eat. I'm getting more successful each year. And of course, I have little helpers along the way. What else do I do? Well, I like photography and I am quite the paparazzi when it comes to my kids. I do a lot of sewing and dabble in woodworking. I do some pattern creating, check out the tabs at the top to see my creations. I work part time as a speech language pathologist doing outpatient rehab for a local hospital. Without doubt, my biggest passion is my children. I homestead because of them and for them. I'm appreciate all of you who have come along for the ride thus far, and I'm thankful you keep checking in on us. For those who are stopping by for the first time, I invite you to stay. We do have a lot of fun, and we're happy to have you join us. 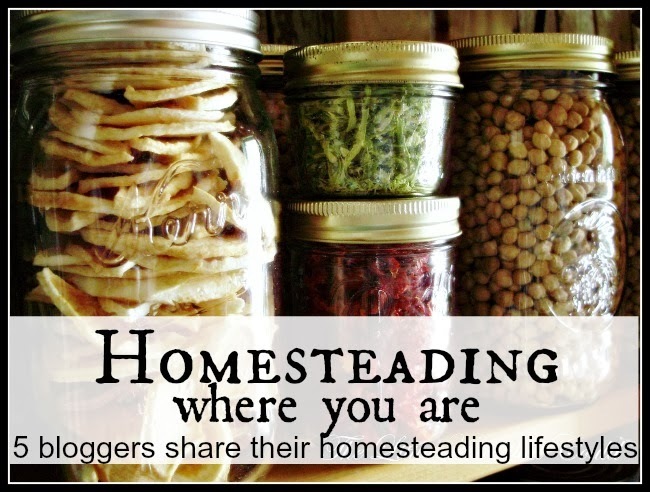 And tell me...your turn readers...what makes YOU a homesteader? What do you on your own? I'm sure it's something. Do tell. Also, remember, I'm not the only homesteader out there. Join these other fantastic women on their journeys. Find us all every Wednesday...and of course many days in between. It will take us a seven weeks to detail that which we do, so do stick around. Daisy, at MapleHill101, currently homesteads with her family in the suburbs of Central Florida. Her vision is to move to a more rural property in North Carolina later this year and continue fostering a self-sufficient lifestyle, which includes chickens, a large garden and a permanent clothesline. Mary, at Homegrown on the Hill, lives in Southwestern Ohio with her family on a 5 acre homestead. Their goal is to be as much self sufficient as possible. In helping with this goal, they raise a big garden and keep chickens, rabbits, and cattle for food. 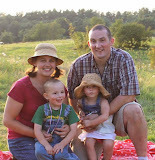 Staci, at Life At Cobble Hill Farm, was bitten by the homestead bug in 2006 and although she began her homesteading ventures in a rented condo, is now homesteading on less than an acre in Upstate NY. Sue – at The Little Acre that Could, shares her body with an auto-immune disease, and life with her husband. They live in a once-working Victorian farm cottage now bordered by a modern subdivision. She has dreamed of homesteading as long as she can remember and continues to strive toward that goal in rural Atlantic Canada. LOVE the photo of everyone smelling the fresh bread! lol You guys do have fun living this lifestyle, and are such an inspiration. Fantastic job! Awesome pictures! Even though I don't have acres of land, I consider myself a homesteader in progress. I grow a garden in the summer, I bake my own bread, I sew/mend, use cloth diapers, homeschool my kids, and I hang my clothes out to dry. There are things I would love to learn (pickling, jams, and preserves). I will never move out of my townhouse unless the moved involved land that would allow me to keep cows, goats, and chickens. Yes, even though I live in a townhouse, I feel I am a homesteader as well. 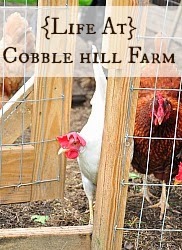 I will be specifically checking out Life at Cobble Hill Farm - it sounds like I could learn from her. I am a new follower here. I found you through Life at Cobble Hill. I am excited to stick around and read about your homesteading. Right now we just have a small garden (15x30) on 1.5 acres. We hope out next step in homesteading will be raising chickens and one day we hope to have a home on many many many acres and farm. I agree, I want this for my kids and family. It's a dream of my husband's and mine and I can't wait to see it unfold. I'm glad you're embracing the homesteader term :) I've called myself a homesteader for a few years now. Everything we do is in effort to move closer to complete self-sufficiency. Each year we do a little bit more and get a little bit closer to our goal, which makes me so happy! Homesteading really is all about the journey I think. There is always something new to learn or a different skill to master. I found your blog through The Little Acre That Could ........ and from what I've read so far, I like you! My oh my! How amazing this post is to read. So proud of you Jackie - makes my heart BURST!